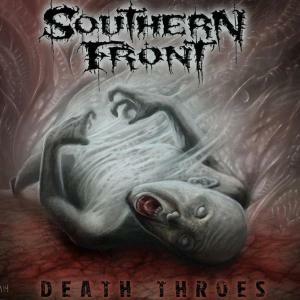 For those that feel an album must be of a certain length, Southern Front’s Death Throes is probably going to disappoint you before it even begins. It’s a quick album and you’ll have to get used to it. Southern Front is not about pumping their albums full of anything irrelevant. Therefore, it’s quality over quantity on this one. It’s just metal and quite heavy metal at that. I’ll admit it even falls a bit short on whether I would call Death Throes an album or an EP, but for eight songs and the punch they pack, it’s an album. Following up their Seasons of Hate EP, Death Throes is a no frills experienced mixed with growling (Lamb of God-like) vocals, copious double bass drumming, and enough guitar solos that give them a more thrashy edge. Face Down is the perfect lead off for this brief, but brutal album. It has a well-rounded mix of speed and viciousness that lets the song teeter between the best of both thrash and death metal. Enter Blood of Christ next which opens the song with a rhythmic cadence of riffs and solos; I like when songs start off like that. It’s like waiting for water to boil and then things start cooking from that point. It’s a nice buildup. The opening bass line in in Burned Awake is audible which is really nice…they have a bassist AND let him be heard. Can’t complain about that, really. Obstacle of Forgiveness is another thrasher built upon speed and uncompromising ferocity. Dead Horse closes the album much in the same manner it started; heavy as f**k. Overall, Southern Front’s latest work is brief, but packs a lethal dose of metal…just metal. Very straightforward metal. Southern Front is building a name for themselves playing live locally in Texas…having opened for some classic thrash metal veterans such as Death Angel and Overkill. Death Throes is an album built on a foundation of early thrash, but incorporates some technical elements and death metal growls; a solid sophomore effort. Below is the interview portion. All of the guys in Southern Front were nice enough to give my questions the roundtable treatment. Hopefully they didn’t find them too ridiculous, but they answered them, so that’s a good sign. Where is the band now? What are you doing; writing, touring, taking a break? Jon: Playing regional shows in TX in support of Death Throes, writing new music. Eric: We’re always in the process of creating something. We have new music coming, we’re promoting the new album, Death Throes, right now. Mainly playing regional shows and planning on a tour in the near future. Payton: We have a string of shows in our area to support the new album. A tour is definitely something on the horizon along with writing new material. Jason: We never take a break and it’s a challenge to get out of TX since we’re in the middle of such a big state, so most of the live support for the immediate future will be in and around the state. We’re working on stretching out further later in the year. It has been said that Southern Front is an intense live experience. Do you have pre-show rituals or do anything to pump you up before hitting the stage? Zak: It usually involves puking before and after. Eric: We drink beer and jam out. Payton: I just try to stay focused on what I have to do. I usually always have some nerves to battle before I hit the stage. Jason: We’re naturally excited and anxious to play so we’re already pumped before playing. I see you have played local support to some classic thrash bands such as Overkill and Death Angel. Would you like to share your experiences with those bands? Do you have a few bands that you are absolutely dying to share the stage with? Jason: It’s always a great experience, of course, but it’s also a great opportunity to pick up small things that they do that makes them professionals. We’ve had the honor to share the stage with a lot of awesome bands and we’d love to share the stage with many more. Testament, Exodus, Slayer, Black Sabbath, Iron Maiden, Judas Priest, Cephalic Carnage, Psycroptic, Decapitated to name a few. Zak: We’ll share the stage with anyone and everyone. Will 2015 see the band working on a follow up to Death Throes? Or will Southern Front continue touring and building momentum for next year? Jon: The follow up will most likely be in 2016. Jason: Yep, but you never know. We’ll spend most of the year supporting the new release and continue working on new music. Maybe a new single will be released this year, but a proper follow up will take a little more time. Eric: Probably won’t have a full release this year, but I’m sure we’ll put something out. It’s one of the benefits of our DIY setup. Zak: We are always working on new tours, music and what have yous. Payton: Definitely going to continue to play shows and do some touring. Hopefully we’ll have some new material for next year. How much input did you have for the Face Down video? Jon: About 80% of the input. Zak: Yeah, we had a lot of input. My little bro is in it and I wanted it to portray the vision I also had in mind. Jason: The video production guys really made everything come together. It was a long day but a great experience. They worked really well with us and made sure we had plenty of input. Payton: It was a complete joint effort by the band and the folks in Outlander Productions. We had some hurdles throughout the shoot, but we were able to adapt and end up with something what we’re proud of. If you could have a “living” guest musician of choice featured on your next album who would you choose and why? Eric: Jeff Loomis ‘cause he shreds like no other. Jason: Marty Friedman or James Murphy. I think they could complement our style the best and they’re big influences. Loomis or Chris Broderick would be cool too. I’d say Alex Skolnick or Jeff Waters but that idea has already been taken. Payton: I’d like to have a guest vocalist. Maybe Randy Blythe (Lamb of God) or Chuck Billy (Testament). Who do you think should fill the drum and guitar void in Megadeth and why? Payton: I hear Chris Adler is in the running for their drummer. He would fit nicely. I’m a fan so it would be cool to see him play with those guys. For guitar maybe Emil Werstler from Daath. I like his style. Jon & Jason: Marty and Menza! Zak: Payton and either Jon or Jason. It would help us blow up. What television shows are you guys really into at the moment? Eric: Always into It’s Always Sunny in Philadelphia and Archer. Better Call Saul’s been getting pretty good. Zak: Last man on Earth. That would be a blast. For a few hours anyway. Payton: Walking Dead for sure, and Always Sunny in Philadelphia. Jason: Game of Thrones and Bob’s Burgers. I’m a huge fan of Archer and It’s Always Sunny as well. For the musicians out there, can you give a rundown of the instruments the band plays? All: Jon and Jason are the lead guitarists, Payton’s on drums, Eric’s on bass, and of course Zak’s on vocals. Jon and Jason play Jackson, Ibanez, ESP and custom guitars through Mesa (Mark IV) and Peavey (5150) amps. Eric plays Warwick through a Kustom. Payton plays Tama Starclassic drums (Birch/Bubinga kit), Mapex Sledgehammer Snare, Axis A-Longboard pedals, and all Sabian cymbals. How did you all meet and ultimately form Southern Front? Jason: It sure does seem that way. There was a lot of time and effort spent over the years putting the band together. I met Jon at a local show, became buddies with him and we eventually found Zak through an ad in the paper. We had a couple others fill out the band on bass and drums. Eventually that unraveled so Payton came in on drums before recording the first album. Eric joined us in time to record on the new album, so he’s the only one of us not on all the recordings. The lineup is solid and we all get along great. Still constantly improving ourselves as a band, individual players and songwriters and it feels like we’ve only barely begun. Payton: I ended up auditioning and getting the gig a few days after. About a month after that we recorded our first album “Join or Die”. What, if any, non-metal bands do you listen to? Zak: Too many to list. Payton: I like my old school country: Merle Hagard, Willie Nelson. I also like a little rap like Dr. Dre, Tech Nine, Eminem. Eric: Pink Floyd’s got to be an all-time favorite. Jason: My list could take up several pages but would contain very few bands that have come out in the last 20 years. Here’s a few: Van Halen, Allman Brothers, CCR, Skynyrd, Aerosmith, The Beatles, Pink Floyd, Neil Young, Johnny Cash, Scorpions, UFO, Santana, Zeppelin, Rolling Stones, Jimi Hendrix, Cream, SRV, Eric Johnson, Ian Moore, Deep Purple, Rainbow, Ten Years After, Jeff Beck, Fleetwood Mac, Dire Straits, Red Hot Chili Peppers, Bob Marley, Guns n Roses. Lastly, have you considered a cover song or two on your next album? If so, what are the possible choices? Eric: Nah. Some of us have wanted to do a ‘tribute’ song before, at least live, but we can’t seem to reach an agreement. We’ll consider any requests though. Payton: Never really felt the need to do a cover but if we did I’d love to do DNR by Testament. Jon: No, cause our singer is a douche! Jason: It’s all Zak’s fault. Haha. Maybe we could talk him into it someday. It would have to be something that would blow people away, even if it’s just instrumental. I prefer the way Metallica does it. They kind of make it their own thing. It’s more of a tribute than a cover. Zak: No, cause I’m a douche. Learn a new song, not an old song. It’s nice to see the band list non-metal bands they listen to. It can’t be metal 24/7, can it? Thank you to Southern Front for taking time out to share your time with A Metal State of Mind. Thank you to Tom George for hooking it all up. Click on the photo of the band to check out the photographer’s personal site. Posted on April 8, 2015, in News and tagged Band Interview., Death Metal, Death Throes, Interview, Southern Front, Texas Metal, Thrash Metal. Bookmark the permalink. Leave a comment.